How many times did I call or text Amy, or one of my other children, with that same question? And how frantic was I when I couldn’t reach them to get the reassurance I needed to know they were ok. My mother radar was in overdrive while my voice of reason kept reassuring me they were safe and sound and I should calm down. Most times our children are okay, but then something happens and your voice of reason disappears. Because the worst possible thing that could happen, did! How many times did I worry if I heard a siren that it could be responding to an accident that involved one of my loved ones and I frantically reached for the phone to confirm they were okay. Even though that siren could be changing someone else’s life or world, as long as my loved one was okay, I gave it no further thought… Normal, yet cold, reaction. I remember when my children were in Catholic grade school, probably grades 1-4, how they would run to the door with their hands folded to say a prayer every time they heard a siren and stood there praying if it went past our home. They did it so often that I became immune to that beautiful display of kindness to a stranger. Now when I hear a siren, I remember August 4 and praying for it to get here as soon as possible! The hours after that are the reason I still occasionally suffer from PTSD! Where are you, Amy? Heaven? Surely a person with a pure heart goes straight to heaven, right? How many times did I say to other grieving friends and family, “well, your loved one is in Heaven now so they are fine.” What gave me the confidence to say that then, yet now I wonder. And why didn’t they ask me how I knew that was so! Why didn’t they get angry at me like I do when someone says that as a way to shut me up, pacify me, or most times, just comfort me. Someone in a recent bereavement class said that after recently reading about NDEs, that given the choice, most people want to stay in Heaven or that dimension. She said what if our children are happier there and don’t want to come home? As a mother, I have prayed every day for my children’s safety and happiness. Surely this can’t be the answer to my prayers for Amy?!? Since I am not feeling warm and fuzzy about my religion, how do I embrace this? I want to believe Dr. Alexander. I sort of do. I am trying. I really am! I haven’t turned the corner, but I am peeking around the corner open more to the possibility that I no longer have to worry about Amy, because she really is just fine. Yes, she sends me signs, but I want more proof. At Christmastime, I did not put up a tree and had no interest in sending out Christmas card? Christmas lost it’s meaning. Yet I wanted people to remember Amy so I decided to make another memorial card and send it out with a subtle holiday greeting. Subtle because joyful does not fit into a grievers world, or should I say my world this past year. Peace is even a stretch. Now, anyway. 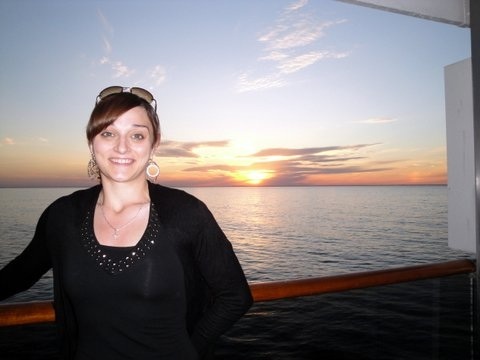 As I looked through the many photos of Amy, searching for the photo for the memorial card, I found this one taken on a cruise from our balcony. I remember knocking on my daughters’ cabin door across the hall and asking Amy to come stand on our balcony. In front of this beautiful sunset! I pray that our sunsets give us a glimpse of where Amy is and that it’s 1,000+ times better there than I could ever imagine. And in my mother’s heart, I hope that it’s a place, that given a choice, Amy would want to stay because she is so happy! Remember Amy Marie, who only wore hoop earrings unless the earrings were a gift from her “Granny”. I was never, ever a worrier. My 21-year-old son was dead for two days in his room before his friends found him. The last text I sent him read, “Hey. Where are you? Call me.” But I didn’t think anything was wrong. Now, how poignant is that? It’s still in my phone. Cathy, thank you for your fierce loyalty to Amy and I but I assure you that those who have hurt me or disrespected our family during this time, do NOT read my blog! I am blessed to be surrounded by a group of wonderful family and amazing friends who have supported me in a way that continues to amaze me! Maybe I don’t thank them enough! All I can see is my pain most days. The emotions of a mother grieving this loss are complicated. As I say all of the time, there is such intense pain that most are not prepared to handle because our connection and history with our child is so deep that losing them pushes most of us to a place of deep despair. Yet, parents do survive. I am new to this pain and feel the need to share my raw journey through the pain.